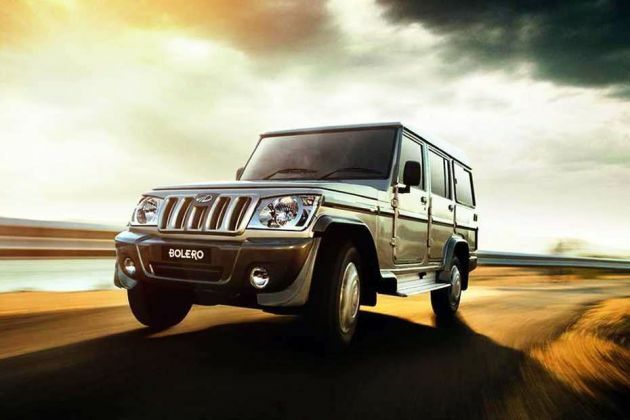 Mahindra Bolero is one of the best selling SUV from the stable of India's home grown car maker, Mahindra and Mahindra. The company is selling it in quite a few variants, out of which, Mahindra Bolero Plus AC is a mid range trim. It is equipped with a 2.5-litre diesel engine, which comes with a displacement capacity of 2523cc. It can generate a maximum power of 63bhp in combination with a peak torque output of 180Nm. It is incorporated with a common rail based direct injection fuel supply system, which allows it to deliver 13.96 Kmpl on the highways and 9.4 Kmpl in the city traffic conditions. Its fuel tank capacity is about 60 litres, which helps in planning longer journeys. Its braking and suspension mechanism are quite proficient, which keeps it well balanced and stable at all times. The front wheels are fitted with disc brakes, while the rear gets drum brakes. Meanwhile, the front axle is assembled with independent type of system with coil spring, whereas the rear gets parabolic leaf spring as well. The car maker is currently offering this SUV in Rocky Beige, Java Brown, Fiery Black, Toreador Red and Diamond White finish option for the buyers to choose from. The overall dimensions of this SUV are quite standard for accommodating minimum nine passengers with ease. Its overall length stretches about 4440mm along with a total height of 1977mm. It comes with a decent width of 1660mm, which also includes external rear view mirrors. The minimum ground clearance is 195mm that helps in dealing with terrains and it has a large wheelbase of 2794mm, which ensures a spacious cabin inside. The frontage is designed with an aggressive radiator grille with body colored slats, which gives it a prominent look. This grille is embedded with a chrome plated company logo in the center and flanked by a hawk-eye shaped headlight cluster. It is powered by halogen lamps and a side turn indicator. The black colored muscular bumper has a wide air dam for cooling the powerful engine quickly. The large windscreen is made of toughened glass and integrated with a pair of intermittent wipers. The sleek bonnet, which has a few visible character lines. The side profile is elegantly designed with neatly carved wheel arches, which also has extended fenders. It is fitted with a robust set of 16 inch steel wheels that are covered with 185/85 R16 sized tubeless radial tyres. The door handles and external rear view mirrors are painted in black color. On the other hand, its rear profile is fitted with a black colored bumper with a pair of reflectors, a bright tail light cluster and a full size spare wheel, which is affixed at the tail gate. The large windshield is integrated with a high mounted third brake light for the safety of the vehicle. The spacious internal cabin is incorporated with wide seats, which are covered with fabric upholstery and provide ample leg space and shoulder room for all passengers. The dashboard is equipped with a few features like AC vents, a voluminous glove box, a three spoke steering wheel and an advanced digital display for the convenience of the driver. The company has bestowed this trim with a lot of utility based aspects, which includes cup and bottle holders, seat back pockets, storage spaces in center console and other aspects as well. Apart from these, it also has easy access parking brake lever, body colored inside door handles and an instrument panel, which houses a low fuel warning light, multi-trip meter, driver seat belt warning notification and so on. It is equipped with a couple of 12V power socket for charging mobiles and other electronic devices. Under the bonnet, this Mahindra Bolero Plus AC variant is equipped with a 2.5-litre m2DICR diesel engine, which comes with a displacement capacity of 2523cc. It is integrated with four cylinders and sixteen valves using a double overhead camshaft valve configuration. This diesel power plant has the ability to churn out a maximum power output of 63bhp at 3200rpm in combination with 180Nm of peak torque between 1440 to 1500rpm. It is mated with a five speed manual transmission gear box, which sends the engine power to its front wheels. It allows the SUV to attain a maximum speed in the range of 120 to 130 Kmph and can cross the speed barrier of 100 Kmph in close to 25.6 seconds. With the help of a common rail based direct injection fuel supply system, it can generate 13.96 Kmpl of decent mileage on the highways. The rack and pinion based power steering system comes with tilt adjustable function, which makes handling comfortable. This steering wheel supports a minimum turning radius of 5.8 meters, which is rather good for this segment. On the other hand, the front axle is fitted with an independent suspension mechanism, which is further assisted by coil spring and anti roll bar for keeping it well balanced. The rear axle is equipped with an elliptical leaf spring type of mechanism. The car manufacturer has given this SUV an efficient braking mechanism. The front wheels are equipped with a set of disc brakes, while the rear wheels are assembled with solid drum brakes. It comes with a number of practical features, which gives the occupants a comfortable driving experience. The list of features include an efficient HVAC (heating, ventilation and air conditioning) unit with multi-dimensional AC vents, which keeps the entire cabin cool. Then the integrated music system is equipped with CD/MP3 player, radio with AM/FM tuner and speakers that enhances the ambiance of the entire cabin. Apart from these, it has power steering system with tilt adjustable function, height adjustable driver seat, front power windows and a few other aspects as well. Being a mid range variant, this Mahindra Bolero Plus AC trim is equipped with quite a few features, which includes seat belts for all passengers, adjustable driver seat, a centrally mounted fuel tank, a high mounted brake light and other aspects as well. It comes with side and front impact beams, which protect the occupants sitting inside in case of any collision. 1. Price tag is reasonably good. 2. Scope to add a few more aspects.